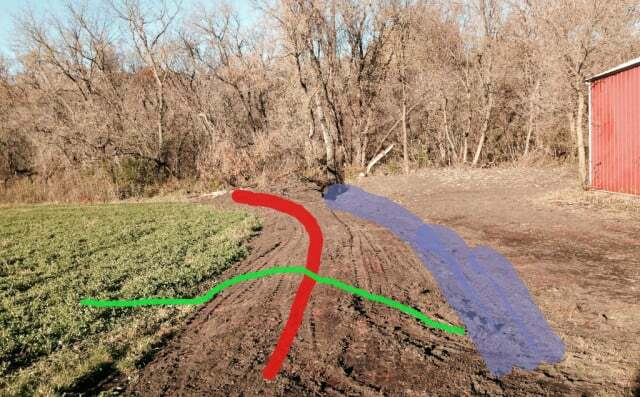 A while ago I challenged folks to create solutions to the erosion and water management issues on the field just west of the barns. This Saturday we’ll begin to implement techniques we hope will address those challenges. Dan Halsey of Southwoods Forest Garden created this plan. 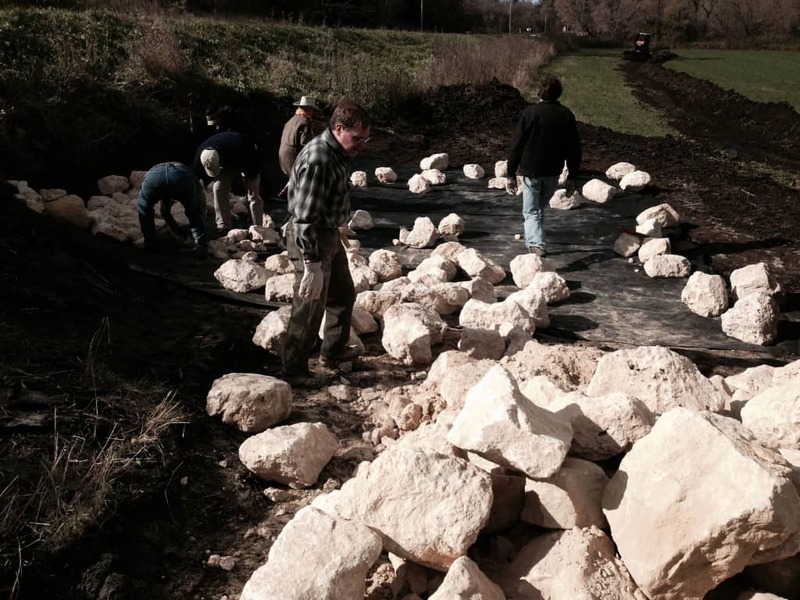 With the help of some heavey equipment and a number of friends, we’ll be creating the rock-lined catch basin at the culvert outflow and building two swale/berm combinations and a final barrier berm. If you want to come and join us, Dan will be giving an explanatory talk at 9:00 (with coffee and donuts, of course) then we’ll head out into the field and use a laser level and other tools to flag the field for the machines, then finish off the berms/swales with seed. Lunch will be provided and a potluck dinner and bonfire will follow. Should be a fine day to get up close and personal with keyline design. The adage ‘Nature abhors a vacuum’ seems true on our farm: disturb the soil and in a few days something will grow – desirable or maybe not. The ‘weeds’ around the strawberries and garlic were pretty awesome this year. . . But this image scares the bejbeebers out of me. 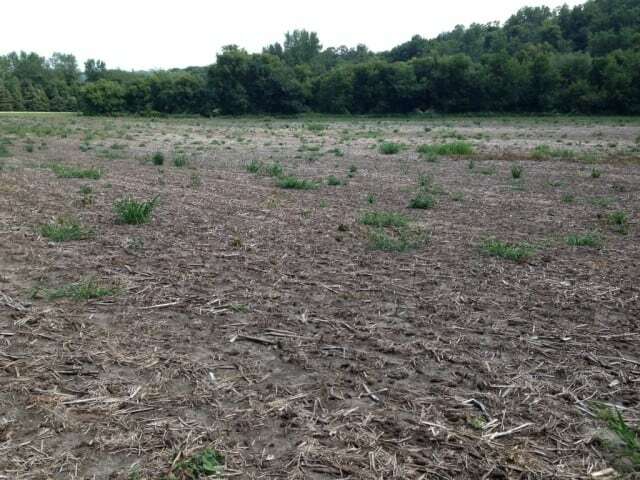 This is a field on the farm just east of ours which, like many fields in SE MN this year, never got planted because of the wet spring. It’s now the second half of August and what’s growing here? Almost nothing. That’s downright creepy. The years of conventional (likely GM) corn and beans and the chemical cocktail that goes with that have killed the soil. Almost nothing is growing. And there are thousands of acres just like this across Minnesota. What do we think we’re doing? Want to help with the farm design? Here’s a challenge for you. The field immediately west of the farmstead (the one that you see in the header photo) appears flat until you look closely. In fact, it’s a gentle valley channeling water north and then east – straight at the pole shed! That’s why I found four inches of ice in the pole shed last March – and why it filled with topsoil in last summer’s huge rain. As you can see from the contour map, the shape of the land sends water right at the pole shed! 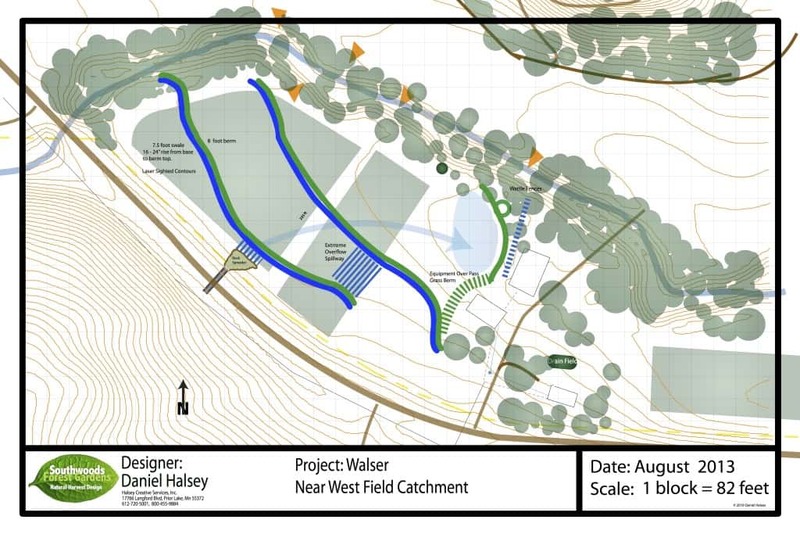 So this is the design challenge: what is the best way to construct berms, swales, dams and/or rain gardens to control the water as it moves across this field in order both to minimize topsoil loss and to increase the dwell time, and thus absorption, of the water? 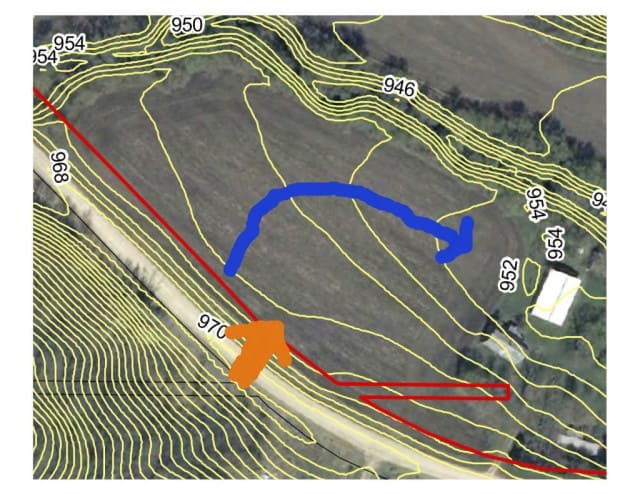 At the moment I’m pondering a rain garden at the culvert opening, a swale/berm (to be planted in perennials, but that’s another blog post) somewhere towards the middle of the field and possibly another berm just west of the pole shed to divert any water that does make it that far. But those are general thoughts. If you’d like to have a go at a specific design, please do! I’m open to your ideas. 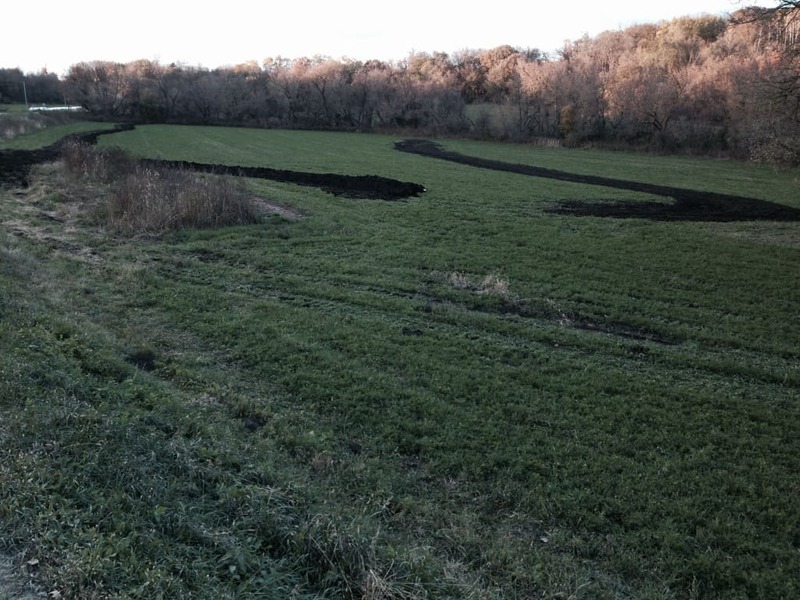 The other factor to keep in mind is that the field will be in alfalfa for the next few years (and may well be used for grazing beyond that time), so access for machinery to cut and bale hay (or for critters in the future) must be included. Thanks to any budding keyline designers who want to try their hand at this. I hope you enjoy the challenge! In a few weeks some friends will be getting married at the farm so I’m trying to spiff up the place for the occasion. The old tractor that I use for mowing is being a bit temperamental so I’ve used it and the trail mower and a regular four-cycle lawn mower to get the ‘lawn’ under control. For heaven’s sake! Not only do I have to invest a silly amount of time in cutting all this grass, but I’m using loads of fossil fuel. How resilient is that?! 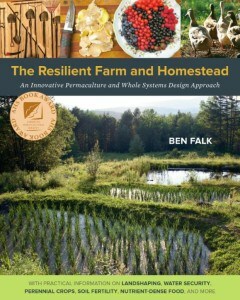 While I’m mowing, I’m pondering Ben Falk’s book, The Resilient Farm and Homestead. 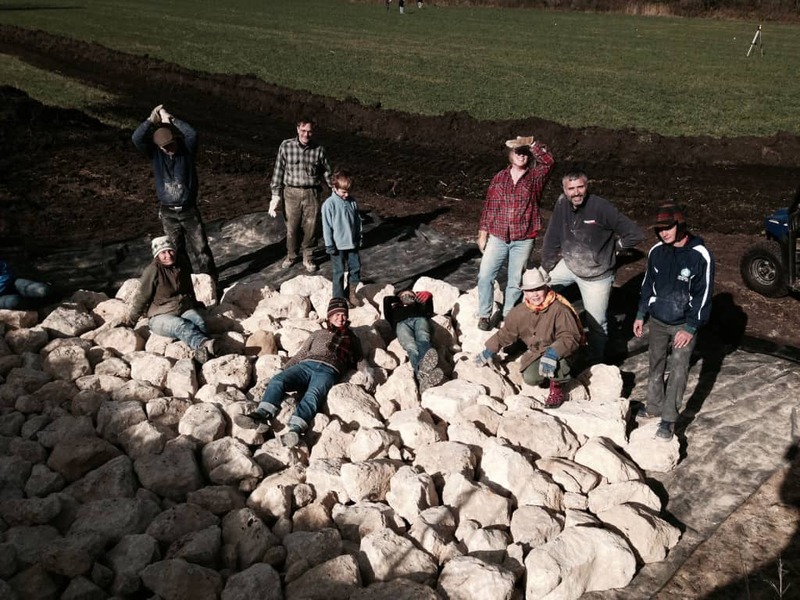 Falk writes about 10 years of developing a permaculture-based, low carbon, resilient farm in the hills of Vermont. In contrast to his densely productive land – developed over many years, to be sure – so much of the space in our farmyard is, at present, just a maintenance issue. Sure there are a few apple trees and a fern or two that could provide fiddleheads, but mostly it’s just, well, there – soaking up my time and energy and wasting precious ‘ancient sunlight‘. This is a permaculture problem, isn’t it? I want to make this part of our farm not just lovely to view and pleasant to visit, but both productive and (relatively) low-maintenance. I wonder, could I establish ‘guilds’ under the apple trees so they are happier and healthier and I don’t have to mow under their low hanging branches? Are there other areas of the farmyard that could be, say, planted to herbs, berries or nut bushes or made into a useful outdoor social space? What might thrive under the black walnut trees? besides growing things, what other activities or ecosystem services could or should take place in this area? The more I think about this the more it seems both that I need a deeper knowledge of permaculture myself and to find some knowledgeable permaculture collaborator(s). Who’s interested? Fourteen inches of snow on Mayday! C’mon! Wet, heavy, miserable stuff that took out about 30 or 40 trees – I don’t have an exact count. Needless to say I’ve been snuggled up to a chainsaw clearing those that fell onto the fields. 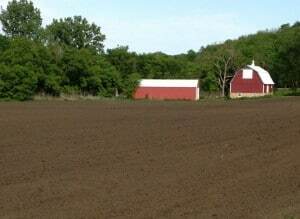 The near west field planted to alfalfa, June 2013. 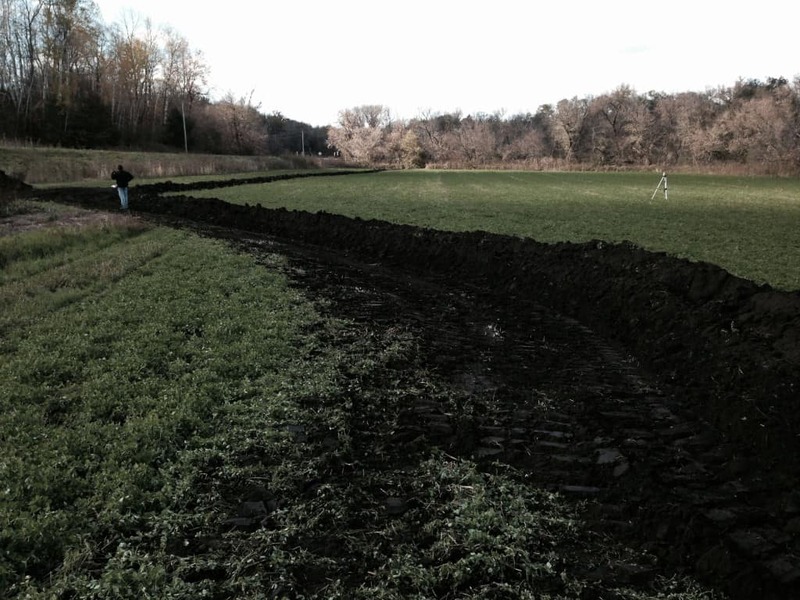 Then in mid-May a look at the fields indicated that something was wrong. The alfalfa wasn’t coming back. Like so many others in SE Minnesota,I found that the winter rains that froze into solid sheets of ice in the low grounds suffocated the alfalfa. With little time to make a plan, I talked to Todd Churchill from Thousand Hills Cattle Company who agreed to replant and manage the alfalfa for the next three years. Whew! 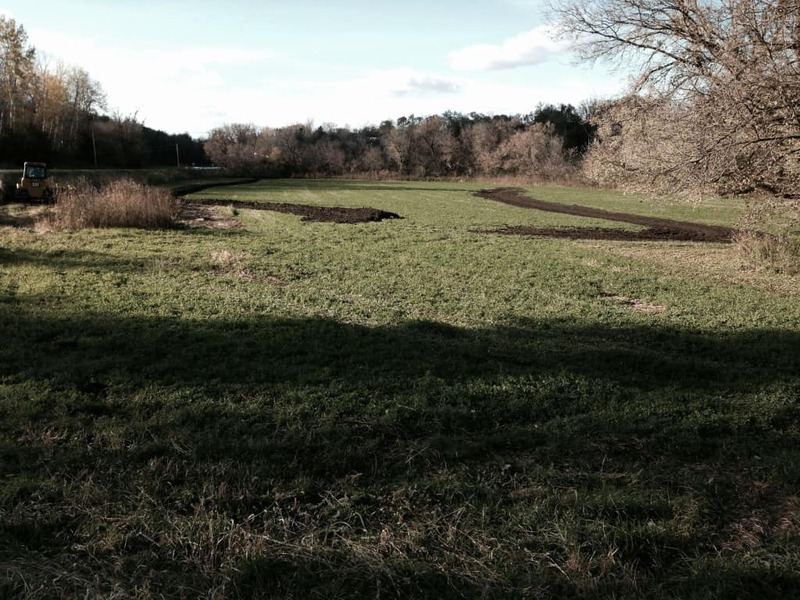 So now I have the tillable portion of the farm leased for three years with a provision for landshaping and limited permaculture preparations. It’s all been replanted now, and we’ll see how the season unfolds. So far, mostly soggy . . . 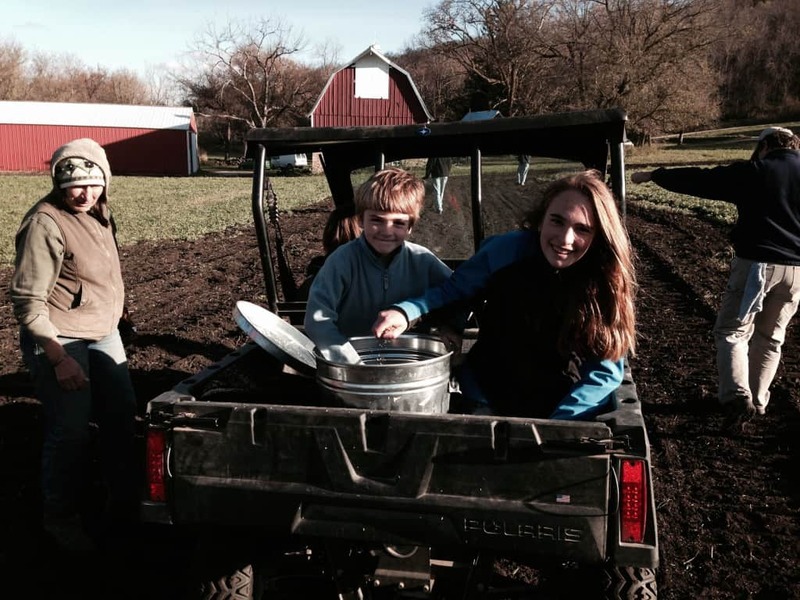 Exploring the contours and dynamics of the farm this winter, I’ve begun to glimpse how it may one day work as an integrated whole: wooded hillsides, stream and wetlands, open spaces and pastures. Though it’s only a small farm there are infinite possibilities for interconnected and complementary animals and plants. When asked, “How big is your farm?” I used to answer in the expected form: “55 acres, about 27 tillable” as if only half the farm is useful or productive. How crazy is that! Inspired, in part, by Mark Shepard’s new book Restoration Agriculture, I now imagine someday seeing all 55 acres integrated into a productive, interconnected and largely self-sustaining enterprise. It’s a huge project and the clearer the vision becomes, the more I realize that what I hope to see is more than I’ll be able to realize on my own. 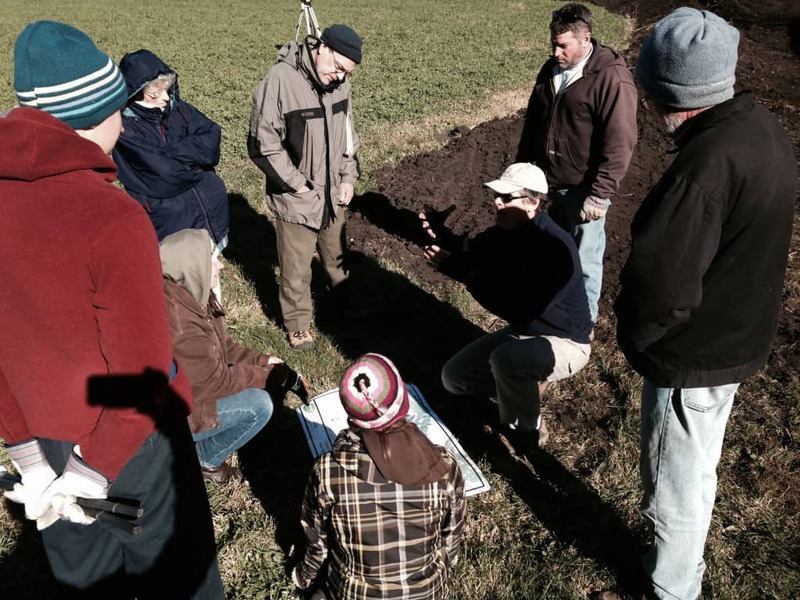 The experienced farmers I know have such an amazing breadth and depth of knowledge – what a greenhorn I am! There is so much to learn needing lots of patient observation, trial, error and time. And there is so much to do: planning, planting, pruning, harvesting, developing markets, managing the finances and all the myriad things that will develop this beautiful place into a beautiful and productive place. The details are still unknown but the broad strokes are clear: here is land to be husbanded for the long haul and the path will likely lead through permaculture. I want to provide access to this land for someone to develop a sustainable, small-scale agricultural enterprise which, over time, would both provide a living and profits, the latter leading to investment in land – perhaps this very farm. For the right partner(s), this could be a thrilling opportunity to create and realize a sustainable farming vision. There must be someone . . .